Do you need to book ahead ? YES! It is imperative to book your trek in advance. The classic Inca Trail is extremely regulated by the Peruvian government and now only allows 500 permits per day (this includes tourists and hiking staff). The alternative treks are less regulated, by still a lot of preparation goes into the hike and we book up quickly. NO! Since June 2002 trekking independently on the Inca Trail has been prohibited. Regulations state that each trekker must be accompanied by a professionally qualified guide. The UGM (Unidad de Gestion Machu Picchu),is the regulatory body responsible for controlling access to MP and the Inca Trail. Companies must meet certain basic requirements proving that they have professional guides and good camping equipment, radio communications and emergency first aid including oxygen. Their license is renewed each year in early March. If the Inca Trail is booked, are their alternative treks to take? Salkantay 7 day trek – moderate to difficult. 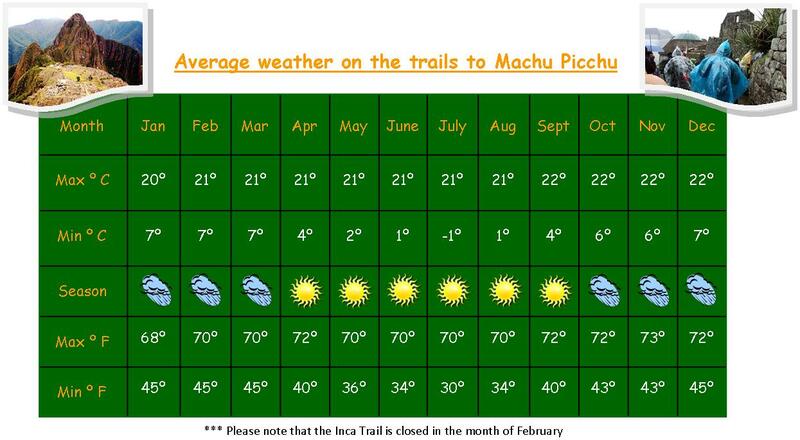 Are numbers of day visitors to Machu Picchu also limited, like those doing the Inca Trail hike? Or can I just buy the bus / train and entrance ticket on the day I want to go? No limit to Machu Picchu number of visitors, everyone can visit the ruins .You can stay overnight in Aquas Calientes and take the first bus up to the ruins, this way you see Machu Picchu before the 1500 visitors of the train arrive. The trains are normally full so make your reservations in advance. How Is the 2 days Inca trail ? Should I pay for the extra porter? All treks include porters to carry all the hiking equipment which includes tents, food, dining equipment, etc. but you will need to pay extra for a porter to carry your belongings. Each 8kg you want carried costs $65 USD. Many people prefer to pay this instead of carrying their clothes on their back. The lighter you pack the less weight/porters you will need to hire. Remember that less is more. Do I need to tip the porters/chef/guide? Generally speaking if all the group have been pleased with the service then it is customary to tip your team. If you aren’t sure about how much to tip the porters and chef, ask your guide and he will answer honestly. If you ever have equipment that you bought for the trek that you think you will never use again, gift them to our porters. You will not find harder workers anywhere. What is the weather on the Trail? Just how tough is it? How fit do you have to be? It is a common misconception that because many people do the Inca Trail that it must be easy … it isn’t. The trail is 45km (26 miles) long and involves great physical exertion to complete. On the second day you climb nearly 1200m (about 4000 ft) in the morning. Combined with high altitude (lack of oxygen) and extreme weather (you can easily burn in the high altitude sun during the day and temperatures can drop to below freezing at night) the trek can be hard work. However all this suffering can make the final arrival at Machu Picchu all the more enjoyable. In general if you take regular exercise and spend a few days in Cusco, or better, in the Sacred Valley, acclimatizing to the altitude you shouldn’t have to suffer too much. Just remember to walk slowly and let your body adjust. The maximum allowed group size is 16 people. Are there toilets on the trail ?